I went to the movies the other day to watch "Immortals" just because of Tarsem Singh; his work is so visually unique and fantastic that even if I hadn’t known he was the director I would have guessed it just by watching the very first scene of the movie. I did not like “Immortals” that much – bad casting (except for the fabulous John Hurt) and bad script; but again, visually striking. Now, tell me: crustless pizza – doesn’t it have “Nigella” written all over it? The recipe comes from the beautiful and delicious "Nigella Kitchen" and it’s very easy, tastes great and you can go wild with the toppings. Perfect quick meal. from the marvelous "Nigella Kitchen"
Preheat the oven to 200°C/400°F. Butter a round ovenproof pie dish, 20 or 22cm (8 or 9 in) in diameter. In a small bowl, beat the egg with the flour, salt, pepper (if using) and milk to make a smooth batter. Stir in half the grated cheese into the batter, then pour it into the prepared dish. Bake for 30 minutes or until golden around the edges. Take the dish out of the oven, sprinkle with the remaining cheese, and add the chorizo or pepperoni, if using. Sprinkle with the oregano. Return the dish to the oven and cook for another 2 or 3 minutes to make sure the topping is heated through and the cheese is melted. Serve, cut into slices (with a salad, if you wish). 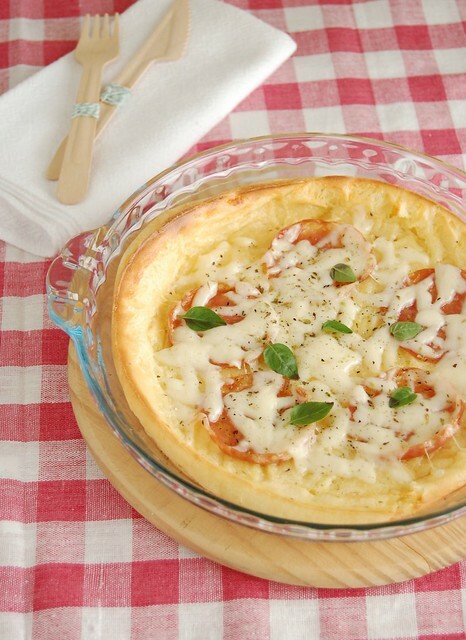 I love this kind of pizza, makes it lighter ! what a super simple pizza. I can see making this even on a weeknight!! Love this idea for a fast weeknight meal! I'm going to top mine with smozed mozzarella, fresh tomato slices, and basil. Interesting--have never seen this type of pizza before. Did you like it? Does it actually taste like a pizza or is it more its own thing? Marvellous and super tempting pizza..
Sarah, I did like it a lot! As Nigella says on her video, the batter is sort of a yorkshire pudding batter. thanks for your lovely sharing..
our websites are 徵信社. and 台南室內設計.